Children from primary and secondary schools travelled to the Lockerbie Academy last Saturday to compete in the Schools Regional Gymnastics Competition. Nearly 380 children took part in the event with children aged from early primary years through to secondary school age. 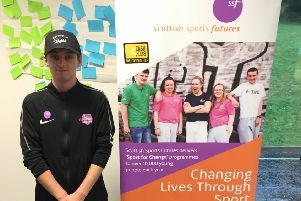 Ninety-four teams competed across seven different levels with the winners and runners up in each age group progressing to the Scottish Finals in Perth with Secondary Schools on March 18 and Primary Schools May 12. This event is one of the main sporting events on the school sporting calendar with the number of entries and the number of schools taking part each continuing to increase. Councillor Ros Surtees, vice-chair, said: “I was pleased to be able to watch the younger children perform and I was impressed to see so many children taking part. We must take time to thank the judges, officials, staff and volunteer helpers on the day and Lockerbie Academy for hosting the event.